A Deluxe minivan for a Versailles private tour! Enjoy the outmost comfort with a driver-guide that will pick you up at the door step of your accommodation. 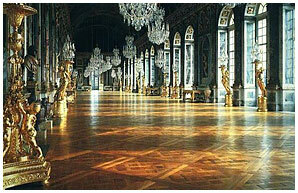 On the way to versailles, you will be told the history of the largest palace in Europe built by Louis XIV. Once arrived you will be driven through the park to see the hamlet of the Queen Marie Antoinette (outside visit), the Petit and Grand Trianon (outside visit). After the park you will visit the inside of the palace with your guide to discover the King's and Queen's Grand apartments, the Hercules Room, Mars Room, Venus Room and of course the hall of mirrors. Thanks to this Versailles guided tour you will understand why this is a unique place to witness what was the opulence and abundance of luxury in which the Kings of France used to live. Once in Versailles, you will have the chance to see one of the most spectacular painted ceiling in Europe comparable to the Sistine Chapel, the Royal chapel where the young 14 years old Marie Antoinette got married with the future King Louis XVI, then you will visit the Abundance room that has been recently renovated, Venus salon, Diana's room, Mars room, Mercury's room, the War room, the world famous Hall of the Mirrors where the treaty of Versailles that ended first world war was signed, King's Bedroom and the Queen's bedroom where your guide will show you the secret door that saved the life of Marie Antoinette in October 1789... and the other rooms with a national licensed guide who will give you all the information to comprehend one of the most important period of the French history. After the visit of the Palace you will have time on our own to stroll through the picturesque French formal gardens designed by the master of the perspectives and Louis XIV landscaper André Lenôtre. *2 Departures at your convenience : 8.am or 1.15pm (let us know your choice of time departure during the booking process in the field "comments".